Download our latest IR documents here. Calendar of IR-related information and major dates. Information and announcements about Mitsubishi Electric's General Meeting of Shareholders. Bonds information and long- & short- term ratings for Mitsubishi Electric. 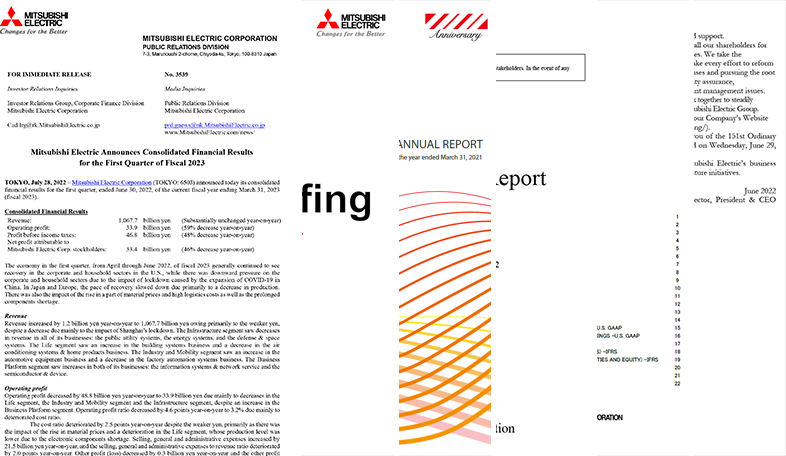 The documents and other materials available on the Mitsubishi Electric Investor Relations website may contain forward-looking statements which reflect Management's current views with respect to certain future events and financial performance. This Web site provides information related to the finance and management of Mitsubishi Electric Corporation and its affiliated companies within the Mitsubishi Electric Group. This information is offered with no provision of guarantees or any assertion of accuracy.